It’s going to be a busy summer, what with that big cycle race going through town, and the Mystery Plays on waggons rolling into town (thankfully not on the same weekend, that might have caused some problems). They’re both happening next month. Meanwhile I wanted to mention a few things happening this month, and in particular the Your Place postcard project. For more information please visit their website. Postcards are available from the first foyer at King’s Manor, where there is also a postbox for them. 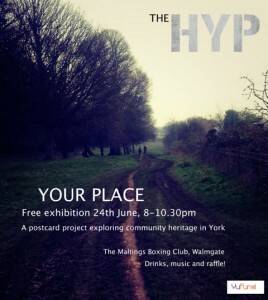 An exhibition of the postcards will be taking place later this month. Taking place between 14 June and 7 July, York Curiouser presents ‘the city explored through contemporary art interventions — colour, texture and word’. You can find poems in the passageways and umbrellas on the Foss, among other things. There’s a handy map on their site. A packed programme from the University of York’s Festival of Ideas includes many free events and exhibitions in the centre of York which may be of interest. The tactile mapping project for example (King’s Manor, Saturday 14 to Wednesday 18 June) or the Fulford tapestry (St Helen’s Church, Thursday 12 to Sunday 22 June). By Lisa @YorkStories • 12 June 2014 Happenings & events To link to this page's proper location please use the > permalink.